The Central Valley Bird Club is sponsoring a second Breeding Bird Atlas for Sacramento County. The previous atlas was organized by Tim Manolis and covered several years from the late 1980s into the early 1990s. 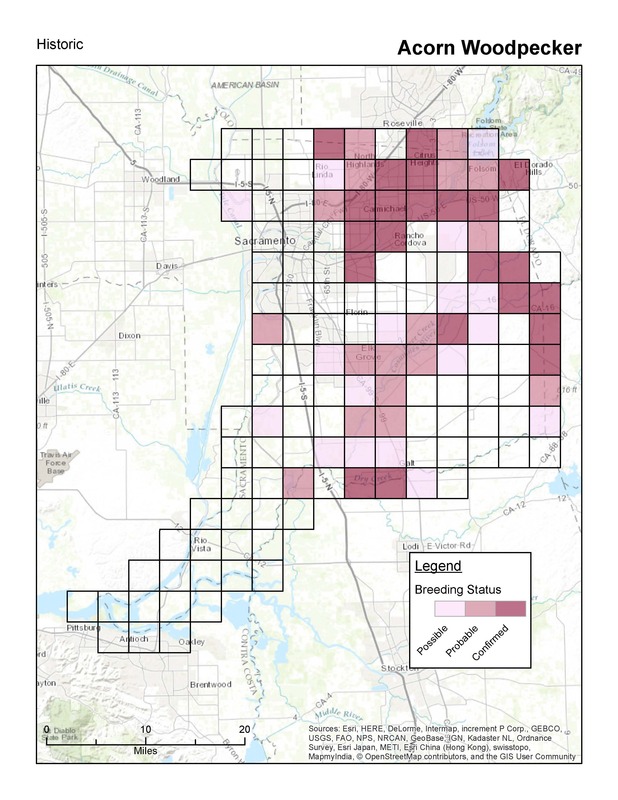 This new atlas project will allow us to compare distributions of breeding birds to see how time and land use changes have affected the breeding bird life in the county. A BBA with a “twist”. The advent of eBird, and the fact that eBird allows users to enter standard Breeding Bird Atlas behavior codes with their lists, gives us an opportunity to take a different approach to this project. Rather than assigning specific blocks within the county specific people, we can invite everyone who birds in the county to record any examples of breeding behavior they observe in the course of their regular birding. IMPORTANT INFO ABOUT HOW AND WHEN TO APPLY THESE BEHAVIOR CODES FOR THIS PROJECT. Click here to see the most current maps showing which BBA blocks are complete and which ones need work. Above is an example from the original BBA showing the breeding status of Acorn Woodpecker in the county at that time.